I said I was going to do it and I did! I was up, not willingly but I got up. Grabbed the clothes I wore the day before, and out the door I went. My snake-boots were still in the car from last night. I would need those at Long Pine Key (LPK for short). Never know what's lurking out there in the picnic area in the dark; didn't want some Eastern Diamondback making a picnic out of me! I stopped at my 'reward-for-getting-up-early-place', Starbucks. Iced mocha coffee and a piece of banana bread. Mmmmm And I was on my way. It was sprinkling when I left the house. Now heading into the glades, it was dry, and dark. I was making pretty good time. In the park, not a drop! I was only running 15 minutes late. I factor that in with my wake up time. I always tell myself I need to be onsite an hour before sunrise. That gives me some wiggle room if I'm late; like today. I took my usual shots, then as the sun rose I glanced around for the light hitting some interesting foliage. Maybe a nice saw palmetto to place in the foreground. Up, down, into the pine rockland forest, and back to the lake. I finally sat down on the picnic table, wondering what my next shot would be, and a bird landed on the table. I just turned my head a bit. It was a female cardinal. Not 3 feet away from me! Then another! I couldn't believe it. I had seen cardinals in the area before, but holy cow! There was no way I would be able to get my camera off the tripod and able to shoot these birds. So I just watched until they flew off. How cool was that! 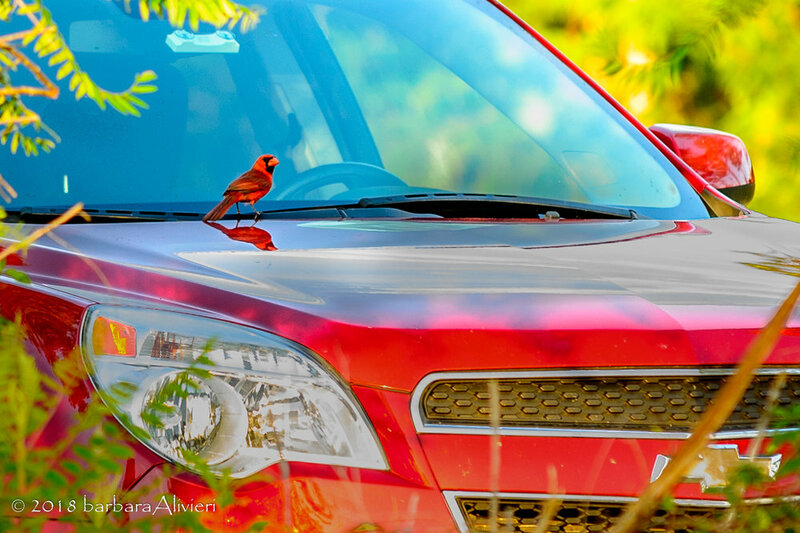 A few minutes later I saw 2 male cardinals on my car! I was able to get a few shots of these guys. Almost like they wanted to get in. Perhaps they are taking lessons from the vultures who try to eat the rubber gaskets around the windshield. Who knows. They too flew off after a while. I figured that was my clue to get out of dodge and go home myself. I was tired and hungry. It had been 2 1/2 hours since the Starbucks visit. Time for an egg muffin and back home. Back home I downloaded my images and finished off the second coffee, trying to stay awake. Hell it was only 9am! I wanted to get at my photos, so I fought the yawns, turned on some tunes and got to processing. Some interesting shots, some not so much. All in all, it was a great day. And come to think of it, I didn't notice too many mosquitoes. Wonder what's up with that? I shall not worry about it, only be glad they didn't bother me too much.